Aranyani Bhargav, the artistic director of Vyuti Dance Company, and her team of dancers aim to question culturally stagnant depictions of pregnancy, through the dance repertoire ‘Questioning Frontality/Changing Body’. The performances became visible sites for subverting notions of the female body and sexuality, through the pregnant performer. 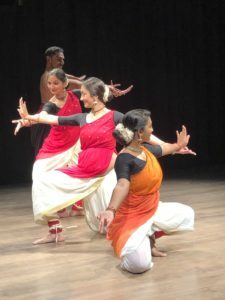 In this interview with The Bastion, Bhargav, possibly the only Bharatnatyam dancer performing while visibly pregnant in living memory, speaks about her work and how it challenges 'stable' notions of performance pregnancy. The labouring maternal body is not an unusual sight. Yet, there are few representations of motherhood outside of the intersection of reproductive labour. Motherhood encompasses a complex system of reproductive possibilities and caregiving along with notions of how pregnant women can ‘acceptably’ publicly present themselves. The natural question that follows then, is how can we best invent new ways of seeing women? Over the years, the maternal body has especially been the site of disruption and creativity for feminist theorists. Art, poetry, music, and dance have been experimented with by feminist practitioners, to provide spaces for new transformative expressions of the pregnant body. 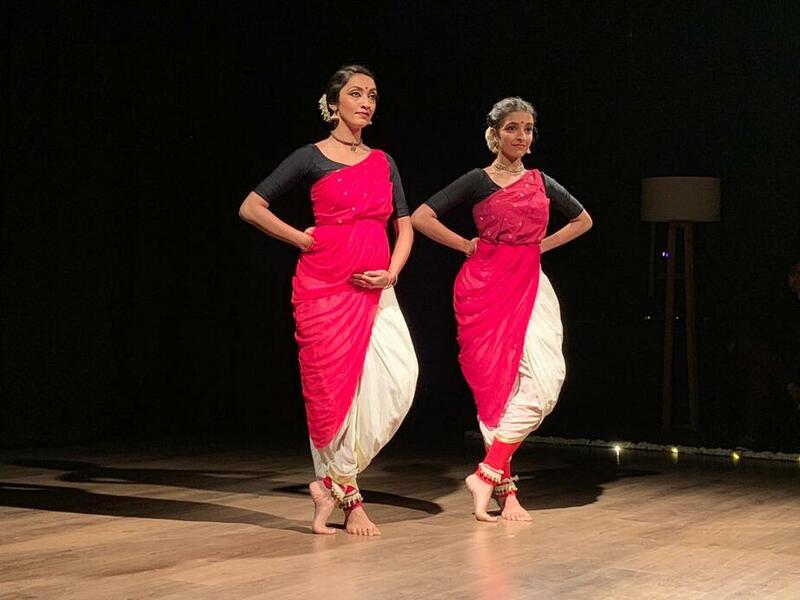 Aranyani Bhargav, the artistic director of Vyuti Dance Company, and her team of dancers aim to question these exact cultural biases surrounding pregnancy, through the dance repertoire ‘Questioning Frontality/Changing Body’ recently performed through the main narrative ‘Sakhi’. Bhargav expresses new visuals of performing pregnant bodies through multiple references, both subtle and obvious while performing in her second trimester. The performance became the site for subverting notions of the female body and sexuality, through the pregnant performer. Bhargav possibly remains the only Bharatnatyam dancer performing while visibly pregnant in living memory. Bhargav possibly remains the only Bharatnatyam dancer performing while visibly pregnant in living memory. Resting after her recent performances, and waiting to welcome her first child, Aranyani spoke to The Bastion about her work, and how being pregnant has impacted it, and ‘stable’ conventions of performance and performers. Supriya D.G. (SDG): How does the dancer respond to objectification and being in the gaze of the public? Aranyani Bhargav (AB): Objectification of the female form is rampant in all societies. I don’t think it is anything specific to dance – in fact, classical dancers are perhaps less objectified than in other dance forms. Nevertheless, that doesn’t mean that classical dancers have not been victims of objectification. Yet, intention is a very important and integral part of creating a performance. Dancers can also objectify themselves if they wish to do so. This could be to provoke a reaction from the audience, or it could be to make a socio-political statement about objectification. There is a huge difference between this kind of objectification and the gaze. It involves the voluntary consent of the “object”, or performer, to be objectified. That is completely different from being objectified unintentionally and against your will. SDG: Did your latest work Sakhi incorporate your pregnancy? Or did you leave the interpretation of your “new form” to the audience? AB: I wanted to normalise the viewing of a pregnant dancing body. So while we acknowledged the changing body, and encouraged the audience to acknowledge and appreciate it too, we did not drastically deviate from our repertoire and draw undue attention to it. I think my pregnant belly did that all by itself! With Sakhi, we had fun incorporating the pregnant form into the bits of narrative where I was performing abhinaya. So, there were moments when we incorporated the pregnancy into the work because to ignore the visibly pregnant body would’ve been a travesty, but the choreography itself was not drastically altered. SDG: Given that this performance incorporates the pregnant form, how was conceptualizing it different from your previous choreographies? AB: Vyuti has been exploring the idea of challenging a singular ‘Front’ since May of 2018. For this idea to reach wider audiences, we chose experimental performance spaces rather than the traditional proscenium theatres, that would accommodate intimate and multi-sided seating or viewing. The choreography was totally transformed to be viewed from all sides of the stage, instead of just the one frontal angle. As we were trying to ‘Question Frontality’ itself, I had to step out of the rehearsal space quite often and view it from multiple angles to see how the choreography looked from non-frontal perspectives. SDG: How did you alter your practice sessions to accommodate for the new performance style, which incorporated your pregnancy? AB: I had to choose which days I would rehearse so I could conserve my energy for the performances themselves which were exhausting even under normal circumstances. They were held consecutively over five days in Delhi and Bangalore. I limited the number of times I practised the more risky moves involving splits and lifts. The practice of listening to my body was tremendously important to me. I never over-exerted myself, and followed my instincts regarding comfort levels. Other than that, the general rules of working out apply here as well – drink plenty of water, warm up well, dance with care and awareness, and cool down afterwards. I rested a full day after my performances during my pregnancy, a luxury I don’t usually allow myself. But my pregnant body was telling me to rest, so I listened to it. SDG: What kind of responses did your visibly pregnant form evoke? AB: We did come across situations where people were unwilling to address the ‘elephant in the room’ (me with my baby bump!). My experience of being pregnant and making a living through displaying my body publicly has definitely shown me that society has not really progressed very much in its attitudes towards public displays of pregnancy and motherhood. One of the things we wanted to explore while performing in an intimate space was interacting with the audience while performing, to actually talk about the pregnancy openly. So we looked directly at members of the audience, and at one point, even went and talked to them. While watching, there seemed to be a tremendous amount of warmth emanating from the audience, and a certain degree of concern for the pregnant dancer. To engage even more with the audience after the performance, we extended an open invitation to them to interact with the performers. But here, very few people were willing to ask questions about my pregnancy or talk about my experience while dancing. Of course, a lot of people approached me privately, expressing their appreciation of the performance and sometimes concern about my pregnant state. Then the review that followed our performance did not mention the pregnancy at all. The photograph used, had me with my back to the audience, more or less concealing my belly bump. SDG: How impactful do you think ‘Questioning Frontality/Changing Body’ has been in challenging perceptions surrounding performance then, in light of these responses? AB: These performances may not have provoked the drastic change in public perception that I wanted. But, most importantly, they have shaken up the audiences into being forced to at least privately acknowledge that dancing through pregnancy is aesthetically and physically possible. ‘Questioning Frontality/Changing Body’ caught the attention of birth networks in India, who were delighted to publicise it as part of their encouragement of Indian women to be active through their pregnancies. 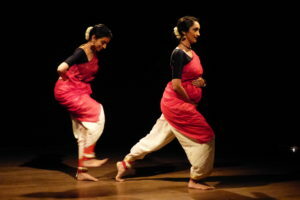 Women-centric organisations and festivals have also asked us to participate in their events because of the performance. So, people do want me to talk about this new form now that the performances are over. SDG: What advice would you give to dancers who, inspired by your example, may consider performing through their pregnancies? AB: While I am an enthusiastic advocate of being active and dancing through pregnancy, I must add that I am not a proponent of disregarding medical advice. I suggest that one makes an informed decision, which would involve a combination of an open dialogue with your doctor and some good reliable reading. Each body is different and each pregnancy is different. You have to do what’s best suited to your body and your pregnancy, combined with informed medical advice. By simply listening to the right medical advice and my body, I have been able to contribute in my own way, to busting some of the oppressive social conventions that surround pregnancy, through what I love most — dancing. And for that, I am extremely honoured.